Tomorrow I'll be announcing who won the February Blogger of the Month Award. There were a LOT of entries, and choosing a winner has not been easy. 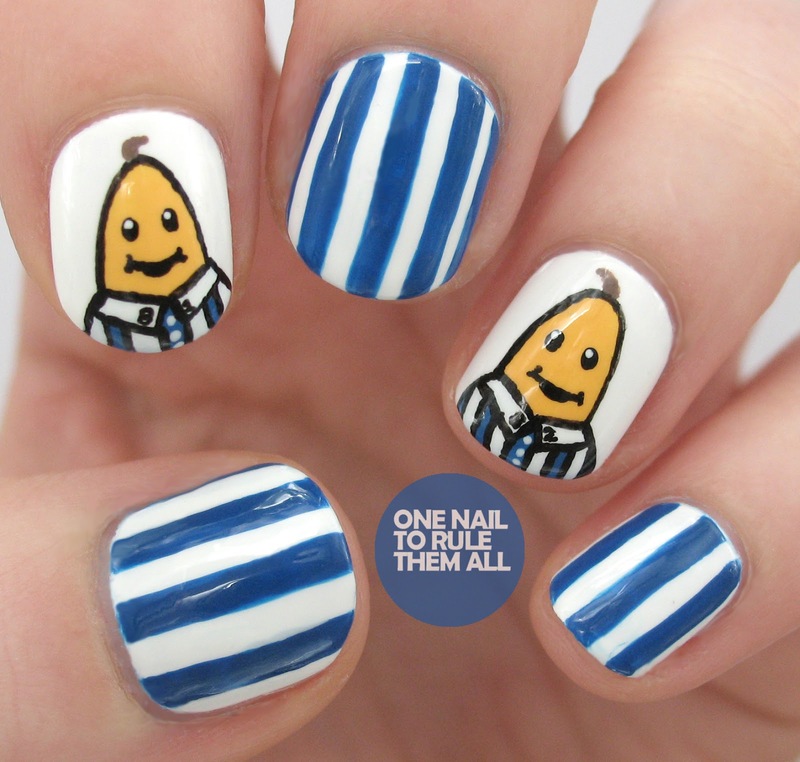 Today you get to see the guest post from January's winner, Alice from One Nail To Rule Them All. Hey everyone! I'm so honoured to be here, writing for such a lovely blog, and to have won such an awesome prize! I've never won anything so I was overjoyed to hear I'd won, and especially so as I absolutely love The Crumpet. 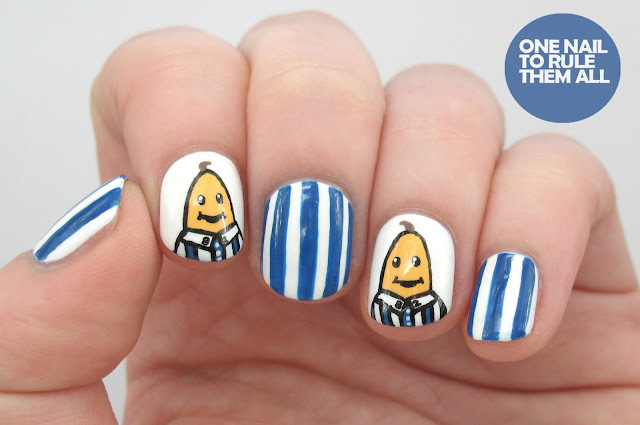 I chose to do Bananas in Pajamas nails because in my head I associated them with Britain, where of course me and Debbie are both from, but after a bit of googling I found out it's Australian, oops! Maybe I should do my research before rather than after next time. Nevertheless, they were still pretty fun to do, and I think they look pretty fun too. Of course, whilst typing this post I'm struggling to get the song out of my head. And if you don't know the song... well I really just don't know what to say, I assume everyone does! For these nails I started off with a base of Essie - Blanc, and then I used a medium length striper brush and Barry M - Cobalt Blue for the stripes. 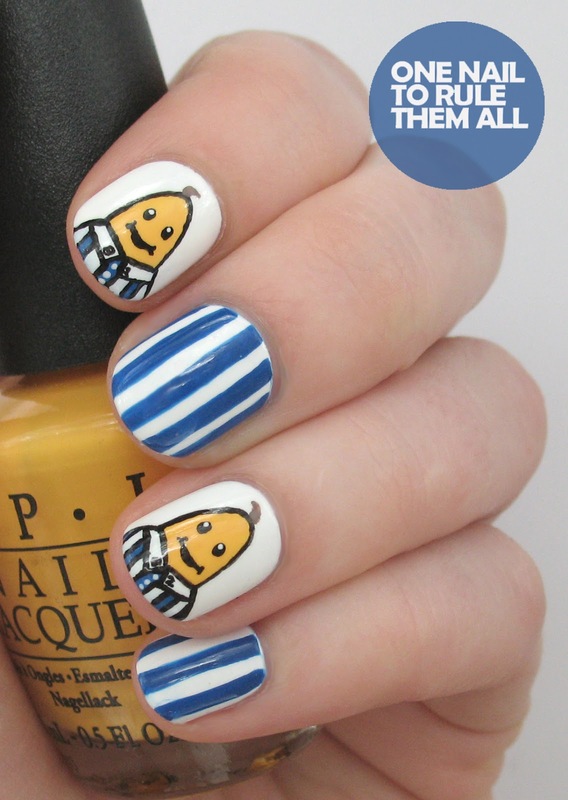 Then using OPI - The It colour and a cut down detailing brush I outlined the shape of the bananas, and used the previous colours for details, with a bit of black acrylic paint. Thank you again to The Crumpet for having me!